This one was a welcome addition to my collection, as I've been keeping tabs on U.K. band Fury for a while now after being impressed by one of their early EPs. 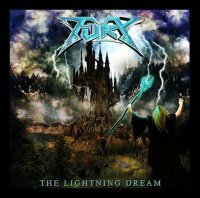 'The Lightning Dream' is their first full-length album, and it's certainly good enough to make Metal fans sit up and take notice. With a name like Fury, it will come as no surprise that this is a straight-up Metal album for fans of the old-school variety. The album contains ten belting tracks that beg to be turned up to ear bleeding volume, with the sort of content that would have had Music For Nations salivating back in the day. Opener 'In To The Dark', an aggressive, perfect introduction to the band, and the equally powerful 'Warrior's Prayer' have been kept from the earlier EPs, but they are excellent tracks so it's a fair shout. Elsewhere, the eight new tracks really demonstrate what Fury are all about, and they are all about Metal, natch. If you miss the days when bands weren't afraid to spend over ten minutes on a track then you'll love this album. Closer 'The Lightning Dream' clocks in at over eleven minutes, with five other tracks pushing past the seven minute barrier. It can be so easy for longer songs to get bogged down and boring, but Fury take to the format like Metal ducks to water. There's over an hour of music here and it's all good. Vocalist Julian Jenkins (hooray for normal names!) has a solid delivery that suits the music, and is backed by a band that more than lives up to the name Fury. Drummer Alasdair Davis, for example, stamps his authority over every track like a rampaging T-Rex. 'The Lightning Dream' is a delightful surprise, showing a U.K. band that have obviously thought long and hard over exactly what they wanted to deliver. Thoughtful, powerful and heavy as hell, Fury have made the first step in what should, if there's any justice, be a successful career.